Campaign songs are important for presidential candidates. It is a way for them to get their supporters emotionally involved and to send them a subliminal message through the music. But not all the artists and musicians are happy that their music is used in this way. The most recent offended artist is none other than the much loved Adele. Usually the candidate will pick a popular song that has lines that identifies with the campaign in some way. 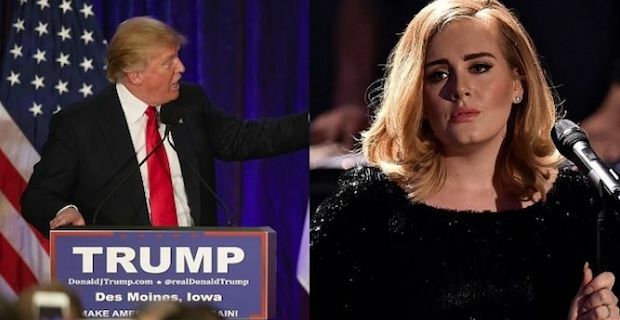 Republican candidate Donald Trump, who happens to be a huge fan of Adele, has been promoting the theme “Make America great again and has decided to use Adeles songs “Rolling in the Deep” and “Skyfall” as his warm up music to his rallies. A spokesperson for Adele recently told The Independent that “Adele has not given permission for her music to be used for any political campaigning”. This is not the first artist that has been less than pleased with Trump. Aerosmith has also sent him 2 cease and desist letters to Trump’s campaign committee for using his “Dream On” song throughout the campaign. He also used Neil Young’s “Rockin’ in the Free World when he announced his candidacy. Young demanded that he stop using his song as it looks as if he is endorsing Trump. REM also told him to “not use our music or my voice for your moronic charade of a campaign” in response to him using “It’s the End of the World”. But of course he is not the first nor will he be the last political candidate to use musicians songs whether they support them or not. And legally they are allowed to do this, to some extent, but that doesn’t make the musicians any happier. Looking back in 2008, George Bush’s campaign song was none other than “Only in America” by Brooks & Dunn, and “Wave on Wave” by Pat Green. In 2012 Barack Obama used legend Bruce Springsteen’s song, “We Take Care of Our Own”.